It's In The Details: QUERY KOMBAT 2014 IS OFFICIALLY OVER!!!! Incredible congrats to co-authors Betsy Aldredge and Carrie DuBois for their winning entry, Shalom Sasquatch! Also, huge congrats to the runner-up Judy Clemens with her fantastic Tag, You're Dead. 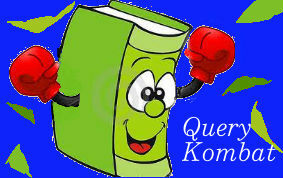 Make SURE you click on all the authors' names and congratulate them on Twitter under #QueryKombat! Stay tuned for the awards ceremony post and judges' thank you coming up soon!